Preprints (earlier versions) of this paper are available at http://preprints.jmir.org/preprint/5218, first published Oct 12, 2015. The field of eHealth is expanding the potential of contemporary medicine . Global aging and its associated burden of cardiovascular disease may expand the scope for innovative Internet interventions [2,3]. Current cardiovascular risk management programs in primary care will become too expensive and, although they are highly effective in research settings [4-6], their effectiveness is markedly lower in daily life . This evidence-practice gap has several causes . Adherence to life-long lifestyle and medication regimens is a serious challenge, illustrated by long-term adherence rates in chronic diseases that average as low as 50% [9,10]. Web-based interventions are cheap, have a wide reach, and they enable self-management . This renders Web-based interventions potentially powerful and scalable tools to enhance sustained adherence in cardiovascular risk management . Older people form an important target population because cardiovascular risk reduction appears effective until old age [13-16]. In 2012, 42% of European people aged between 55 and 74 years used the Internet and this number is increasing . Meta-analyses showed that Web-based interventions targeting single cardiovascular risk factors can induce improvements in adult populations [18-21]. However, optimal cardiovascular prevention and risk management practice, as affirmed by the European Society of Cardiology  and the American Heart Association , requires targeting the complete cardiovascular risk profile. This is particularly applicable for older people, who often have multiple risk factors or already suffered a cardiovascular event. A comprehensive approach would increase the value of Web-based interventions for daily practice. Currently, little is known about the effectiveness of Web-based interventions in older people. In this systematic review and meta-analysis, we aim to answer the question whether Web-based interventions for cardiovascular risk factor management reduce cardiovascular risk and disease in older people. We performed a systematic literature search for randomized controlled trials (RCT) on Web-based interventions in older people targeting one or more cardiovascular risk factors and/or disease. Methods were predefined in a research protocol using the PRISMA checklist and the Systematic Reviews Guidelines of the Center of Reviews and Dissemination (Multimedia Appendix 1). We defined Web-based interventions as Web-based participant-centered treatment or prevention programs delivered via the Internet and interacting with the participant in a tailored fashion [24,25]. Internet had to be the main medium through which the intervention was delivered, but other media (phone, face-to-face) could be included too. We excluded the following eHealth interventions: telemonitoring, telemedicine, and mobile phone-mediated interventions. The target of the intervention had to be one or more cardiovascular risk factors and/or cardiovascular disease. Thus, we included interventions for both primary and secondary prevention of cardiovascular disease . The target population had to have a mean age of 50 years or older and could have a mixed level of cardiovascular risk (one or more cardiovascular risk factors or established cardiovascular disease). Main outcomes of interest were incident cardiovascular disease (myocardial infarction, angina pectoris, heart failure, stroke or transient ischemic attack, and peripheral arterial disease), cardiovascular mortality and overall mortality, and changes in cardiovascular risk factors including blood pressure (BP), glycated hemoglobin A1c (HbA1c), low-density lipoprotein (LDL) cholesterol, smoking status, weight, level of physical exercise, or a composite cardiovascular risk score. We performed a comprehensive literature search in the EMBASE, Medline, CINAHL, and Cochrane databases from 1995 onward (because the Internet was not widely available before then). Key search terms were cardiovascular risk factors and diseases (separate diseases and risk factors specified), terms related to aspects of cardiovascular risk management (eg, diet, exercise, BP control), Web-based interventions (including all definitions and synonyms), and RCT/review/meta-analysis. The search was last updated on November 3, 2014 by CRB. The comprehensive search strategy is provided in Multimedia Appendix 2. Studies were included if (1) they were on Web-based interventions targeting cardiovascular risk factors and/or disease, (2) study design was a RCT, (3) at least 50 patients were included, (4) mean age was at least 50 years, (5) the duration of the intervention was 4 or more weeks and follow-up was 3 or more months, (6) at least one of the outcomes of our interest was reported, and (7) language was English. Study selection was performed by two independent researchers (CRB and BS) by means of screening of titles and abstracts, and thereafter reading full texts on the basis of the inclusion criteria. If two publications described the same trial, the paper that reported the primary outcomes of the trial was included. Disagreements were resolved by discussion or by a third investigator (ER). We assessed reviews and meta-analyses encountered with our search strategy to check for additional relevant articles. Two reviewers (BS and CRB) extracted data using a predefined data extraction form (Multimedia Appendix 3) for half of the included articles and checked each other’s results. Extracted information included study characteristics, patient baseline characteristics, characteristics of the intervention and control conditions, and available data on clinical and intermediate outcomes. For BP, glucose control, weight, lipids, and physical activity level, we extracted all baseline and follow-up levels, change scores or mean differences. Corresponding authors were contacted if needed. We used an adapted Cochrane Risk of Bias Tool to evaluate randomization procedures, representativeness of study populations, blinding of outcome assessors (blinding of participants was usually not possible due to study design), completeness of outcome data, and completeness of reporting. For categorical variables, we calculated odds ratios with 95% confidence intervals. We estimated pooled odds ratios with Mantel-Haenszel random-effects models. For continuous outcomes, mean differences or standardized mean differences (Hedges’ g effect sizes) with 95% confidence intervals were calculated. We estimated pooled effects with DerSimonian and Laird random-effects models. All HbA1c values were converted to percentages. All LDL cholesterol values were converted to mg/dL. All weight values were converted to kg. For level of physical activity, which was assessed with various instruments, we calculated standardized mean differences and 95% confidence intervals. If mean differences or standardized mean differences were reported, we included them directly in the pooled analyses. If not, we calculated change scores (difference between baseline and follow-up within group) or values assessed at follow-up. If values were measured at multiple time points, we used the values recorded at the last follow-up contact. For studies with multiple arms, we included only one intervention arm in the meta-analysis in order not to create “unit-of-analysis” error by double counting the control group. Where possible, we selected the Internet-only intervention arm. No data were imputed. We estimated pooled effects for all single cardiovascular risk factors. To address the overall question of efficacy of Web-based interventions for cardiovascular risk factor management, we evaluated the effect on cardiovascular composite scores, clinical outcomes (cardiovascular morbidity and mortality), and pooled the standardized primary outcomes of all studies. We used the primary outcomes as defined by the authors of the studies. Funnel plots were inspected to assess for potential publication bias. Statistical heterogeneity was assessed using Q and I2 tests. We explored reasons for heterogeneity by jackknife analysis and subgroup analyses. We assessed the following factors in subgroup analyses: study duration (predefined, short term [<12 months] versus long term [≥12 months]), type of cardiovascular prevention (primary versus secondary) , and type of intervention (Internet only or “blended” [Internet application combined with human support]). Subgroup analyses were performed on the studies used for the analysis on primary outcomes only. The latter subgroup analysis (on type of intervention) consisted of two separate analyses, one to evaluate the Internet-only interventions versus the control conditions and one to evaluate the blended interventions versus control conditions. In case a study tested both types of interventions with a multiple-arm design, the appropriate arm was included for each analysis. In addition, we performed a mixed effects meta-regression using the unrestricted maximum likelihood method to explore the association between study duration and effect size (standardized primary outcome). Last, we performed sensitivity analyses for the different domains of the risk-of-bias assessment by repeating the analysis on standardized primary outcomes in subgroups of studies with low risk of bias versus studies with an unclear or high risk of bias. For this analysis, we wanted to include all studies that contributed to one of the meta-analyses. Therefore, we complemented the sample of studies with defined primary outcomes that were cardiovascular risk factors of interest with studies that had not defined their primary outcome. If there was no defined primary outcome, we used the cardiovascular risk factor that was targeted most directly in the intervention studied. We used Review Manager 5.2 to draw the risk-of-bias assessment figure and to calculate standard deviations or 95% confidence intervals in cases where only standard errors were available in the original data. We used Microsoft Office Excel version 10, SPSS version 20, and Comprehensive Meta Analysis version 2.2.064 for the statistical analyses. The search yielded 5251 papers after removal of duplicates. We did not identify additional studies by searching reference lists. After screening of titles and abstracts, 462 papers remained. Review of these full texts resulted in 57 RCTs (corresponding with 84 papers) that fulfilled the selection criteria and were included in the systematic review. We contacted 16 authors to request additional data: nine authors responded and three authors complied with our request. 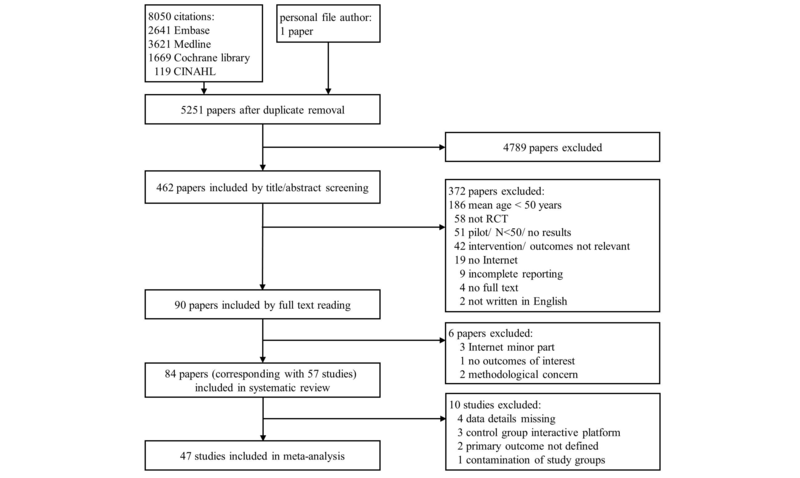 Out of this final selection, 47 studies could be included in the meta-analysis (see Figure 1 for PRISMA flowchart). Figure 1. Prisma flowchart illustrating literature search. The 57 RCTs included 19,862 individuals (Tables 1-5). Study sample size ranged from 61 to 2140 participants. Median study duration was 9 months (interquartile range [IQR] 6, range 3-60 months). The mean dropout rate was 15% (range 0%-62%). The mean age of the study populations ranged from 50 to 71 years. In only 7 studies were all participants older than 50 years of age. All participants had an increased risk of cardiovascular disease: 46 studies conducted primary prevention (control of cardiovascular risk factors or diabetes) and 11 studies conducted secondary prevention. In 41 studies, the intervention targeted a single cardiovascular risk factor; in 16 studies, multiple risk factors were addressed. We found no studies on interventions for smoking cessation meeting our inclusion criteria. In most studies, the primary outcome was change in a specific cardiovascular risk factor targeted by the intervention. Sixteen studies reported on clinical outcomes including new cardiovascular events [26-31] and mortality rates [29-41] as a part of adverse event monitoring. All interventions included lifestyle education and were participant-centered. Forty-four studies stimulated self-management by means of goal setting and self-monitoring. Half of interventions were stand-alone Internet platforms and the other half were “blended” (ie, the platforms were supported by a nurse or another health care professional). Intervention usage was reported by 22 studies. The median percentage of participants logging in to the intervention platform was 72% (range 33%-100%). Methodological quality of the included studies varied (Multimedia Appendix 4). Most studies adequately described the randomization and allocation concealment procedures. Due to the nature of the interventions, none of the studies had a double-blind design. In 20 studies, outcome assessors were blinded [27,29,30,32,34-40,42,52,54,57,59,61,64,67,81], in 19 studies blinding was not mentioned or unclear [28,31,33,41,43,44,46,48,53,56,60,63,65,69,71,74,76,77,80], and in 18 studies outcome assessors were not blinded [26,45,47,49-51,55,58,62,66,68,70,72,73,75,78,79,82]. Of the 57 studies included in the systemic review, 47 studies [26-32,34-42,44-53,55-60,62,64-68,70,73,74,76-79,81,82] provided sufficient information to be included in the meta-analysis. The mean age of the study populations of these 46 studies had the same range as the complete sample of 57 studies. The pooled analysis showed a significant reduction in both systolic and diastolic BP favoring the intervention (26 studies; n=7720; Figures 2 and 3). For systolic BP, the weighted mean difference was –2.66 mmHg (95% CI –3.81 to –1.52; I2=53%). For diastolic BP, the weighted mean difference was –1.26 mmHg (95% CI –1.92 to –0.60; I2=46%). a Abbreviations: BP: blood pressure; CASM: computer-assisted self-management; CASP: computer-assisted self-management + problem solving treatment; CV: cardiovascular; DM: diabetes mellitus; DM2: type 2 diabetes mellitus; GP: general practitioner; HbA1c; glycated hemoglobin A1c; HDL: high-density lipoprotein; LDL: low-density lipoprotein. b For studies with more than 2 arms, this arm was used for all analyses. c For studies with more than 2 arms, this arm was used for the subgroup analysis on blended interventions. Figure 2. 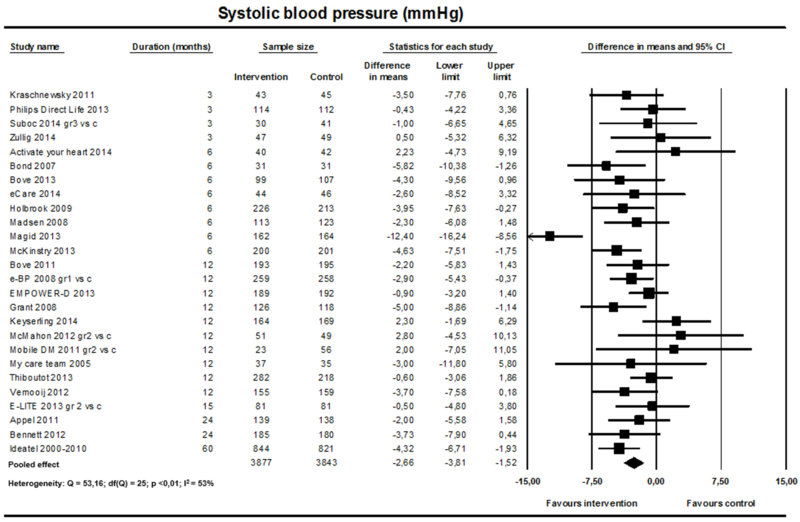 Effect on systolic blood pressure (26 studies). a Abbreviations: BP: blood pressure; GP: general practitioner. a Abbreviations: BMI: body mass index; CV: cardiovascular; GP: general practitioner; PA: physical activity. d Control arm consists of same interactive Internet platform as intervention arm. a Abbreviations: BMI: body mass index; CHD: coronary heart disease; CVD: cardiovascular disease; DM: diabetes mellitus; DM2: type 2 diabetes mellitus; LDL: low-density lipoprotein. b Control arm consists of same interactive Internet platform as intervention arm. c For studies with more than 2 arms, this arm was used for all analyses. a Abbreviations: BMI: body mass index; BP: blood pressure; CHD: coronary heart disease; CV: cardiovascular; CVD: cardiovascular disease; CVRM: cardiovascular risk management; DM: diabetes mellitus; GP: general practitioner. Figure 3. 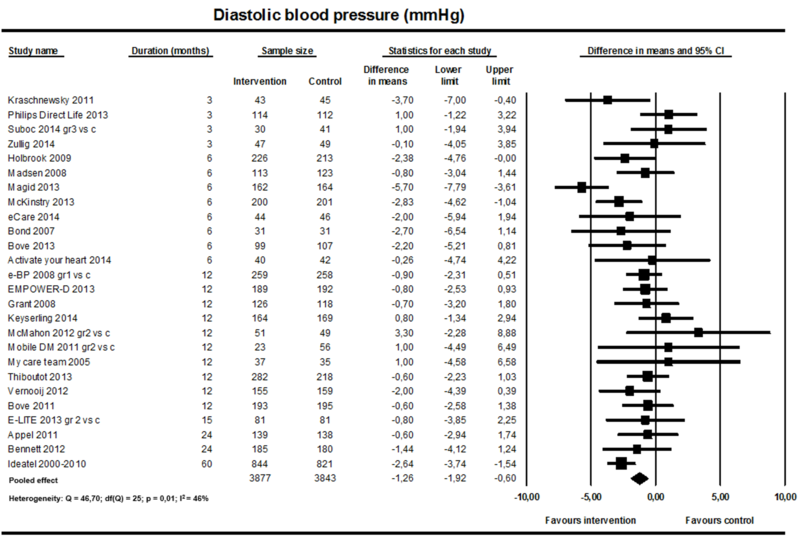 Effect on diastolic blood pressure (26 studies). A significant reduction in HbA1c level favoring the intervention among patients with type 2 diabetes mellitus was found (21 studies; n=6518; Figure 4). 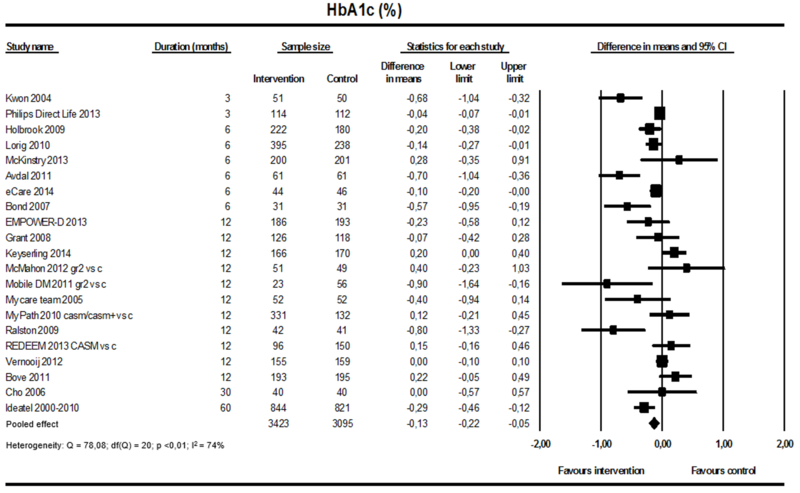 The weighted mean difference for HbA1c was –0.13% (95% CI –0.22 to –0.05; I2=74%). The jackknife procedure did not reveal one particular study responsible for high heterogeneity. Figure 4. Effect on glycated hemoglobin (21 studies). Fifteen studies tested interventions for weight loss and two studies tested interventions for maintenance of weight loss. 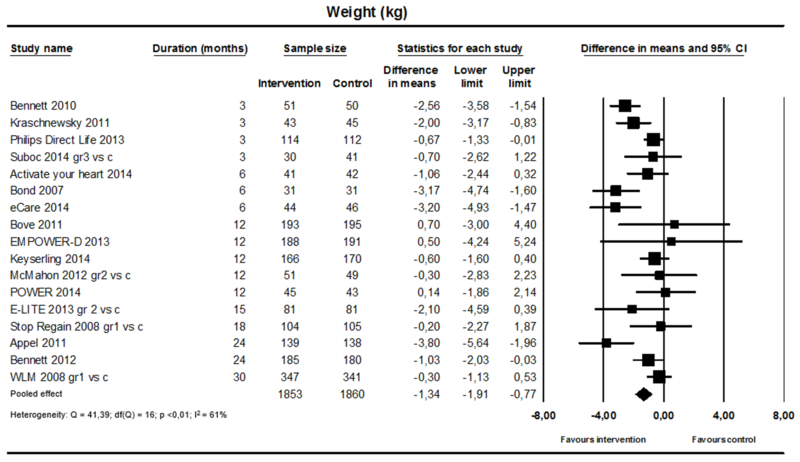 The pooled analysis (17 studies; n=3713; Figure 5) showed a significant reduction in weight favoring the intervention (weighted mean difference –1.34 kg, 95% CI –1.91 to –0.77; I2=61%). A sensitivity analysis leaving out the two studies on weight loss maintenance resulted in a similar effect size and level of heterogeneity. The jackknife procedure identified three studies contributing considerably to heterogeneity [35,42,59]. Figure 5. Effect on weight (17 studies). 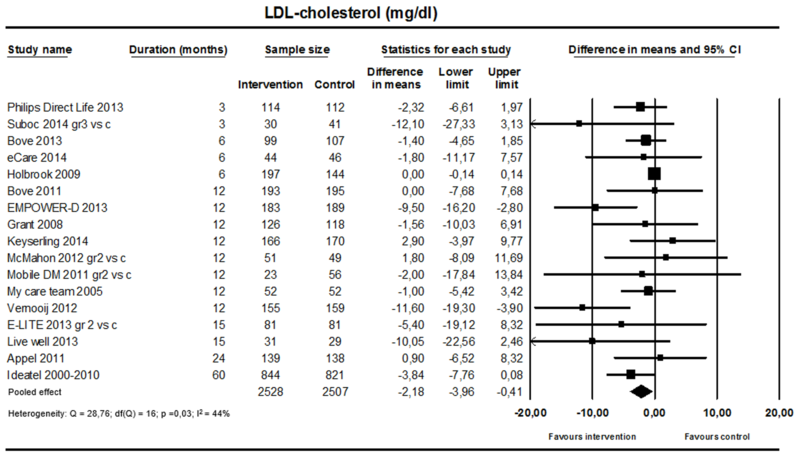 A small but significant reduction in LDL cholesterol favoring the intervention was found (17 studies; n=5035; Figure 6; weighted mean difference –2.18 mg/dL, 95% CI –3.96 to –0.41; I2=44%). Figure 6. Effect on low-density lipoprotein cholesterol (17 studies). Fourteen studies (n=4444; Figure 7) reported the effect on physical activity. Eight studies used self-reported physical activity levels in minutes per week, five studies used daily step counts obtained from pedometers, and one study measured physical activity with accelerometers. Because of the differences in measurement instruments, we calculated standardized mean differences. 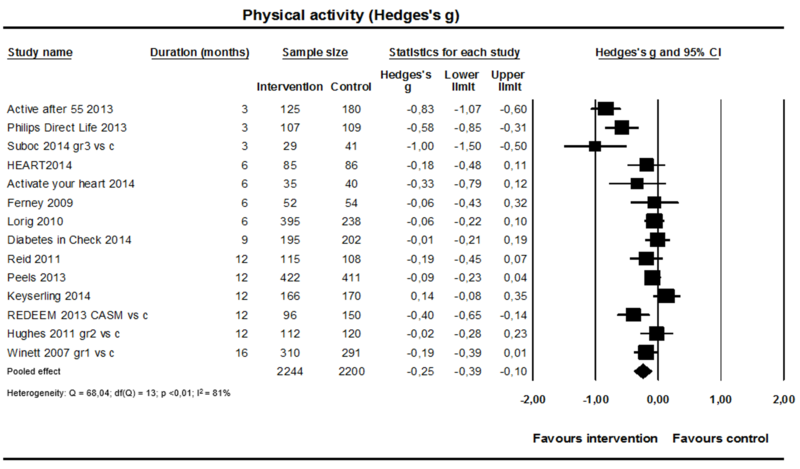 A small significant difference in increase of physical activity levels was found in favor of the intervention (weighted standardized mean difference 0.25, 95% CI 0.10-0.39; I2=81%), but heterogeneity was high. The jackknife procedure identified one study  driving a substantial part of heterogeneity; without this study, I2 was 68%. Nine studies (n=2321; Figure 8) reported a cardiovascular composite score. Five studies reported the Framingham 10-year cardiovascular disease risk score, three studies reported the Framingham 10-year coronary heart disease risk score, and one study reported a clinical composite score based on number of cardiovascular risk factors on target (BP, HbA1c, body mass index, LDL cholesterol, physical activity, albuminuria, foot ulcers, and smoking). Because of the differences between the composite scores, we calculated standardized mean differences. A small significant improvement of the cardiovascular composite scores was found (weighted standardized mean difference –0.10, 95% CI –0.18 to –0.02; I2=0%). Finally, we pooled the primary outcomes of the 37 studies (n=11,021; Figure 9) that defined a primary outcome (systolic BP: 7 studies; HbA1c: 13 studies; weight: 8 studies; physical activity: 6 studies; cardiovascular composite score: 3 studies). The weighted standardized mean difference was –0.24 (95% CI –0.31 to –0.16; I2=69%) in favor of the intervention. The jackknife procedure revealed that one study  somewhat influenced the heterogeneity; without this study, heterogeneity dropped to 64%. The funnel plot (Multimedia Appendix 5) indicated that small studies reporting large effects might be overrepresented. The Egger’s test confirmed that the funnel plot was not symmetrical (P=.01). Figure 7. Effect on physical activity (14 studies). Figure 8. Effect on cardiovascular composite scores (9 studies). Figure 9. General effect on primary outcomes (37 studies). Six studies (n=1904; 1 short-term and 5 long-term studies) reported on cardiovascular event rates. The mean length of the studies was 13 months (range 6-24 months). The pooled analysis showed no difference in rate between groups (pooled OR 0.75, 95% CI 0.39-1.42; I2=27%; Figure 10). Total mortality rates were reported in 13 studies; in five studies, no deaths occurred and in the other eight studies, there were no differences between groups. Figure 10. Effect on cardiovascular event rates (6 studies). Figure 11. Association between study duration and effect size (Hedges' g). One outlier study (Ideatel) was removed from analysis. Results are summarized in Table 6. Within the analysis of pooled primary outcomes, the intervention effect was more pronounced in the short-term studies (15 studies; n=2934; standardized mean difference –0.43, 95% CI –0.57 to –0.29; I2=69%) than in the long-term studies (22 studies; n=8087; standardized mean difference –0.12, 95% CI –0.19 to –0.06; I2=41%). The same pattern was found for all other outcomes except for LDL cholesterol (Multimedia Appendix 6). There were no substantial differences in effect size between studies on primary prevention versus secondary prevention. To further explore the studies targeting primary prevention, we compared studies with populations of relatively low age (not all participants older than 50 years, n=29) with studies with populations of older age (all participants older than 50 years, n=4). The pooled effect size was larger for the studies with older participants (Hedges’ g=–0.30) than for the studies with relatively younger participants (Hedges’ g=–0.23), but the confidence intervals overlapped largely. We repeated the analysis of pooled primary outcomes on the sample of studies testing an Internet-only and a blended intervention. The intervention effect was more pronounced in the sample of blended studies (26 studies; n=7538; standardized mean difference –0.33, 95% CI –0.43 to –0.22; I2=78%) compared to the sample of Internet-only studies (14 studies; n=4280; standardized mean difference –0.15, 95% CI –0.23 to –0.07; I2=40%). a Subgroup analysis performed in the sample of studies that was used for the analysis of primary outcomes. b Subgroup analysis performed on the sample of studies that targeted primary prevention (including diabetes control). c Subgroup analysis performed on the sample of studies that evaluated an Internet-only intervention. In case a study tested multiple arms, the appropriate arm was included in the analysis. d Subgroup analysis performed on the sample of studies that evaluated a blended intervention. In case a study tested multiple arms, the appropriate arm was included in the analysis. Table 6. Subgroup analyses within the analysis of standardized primary outcomes. 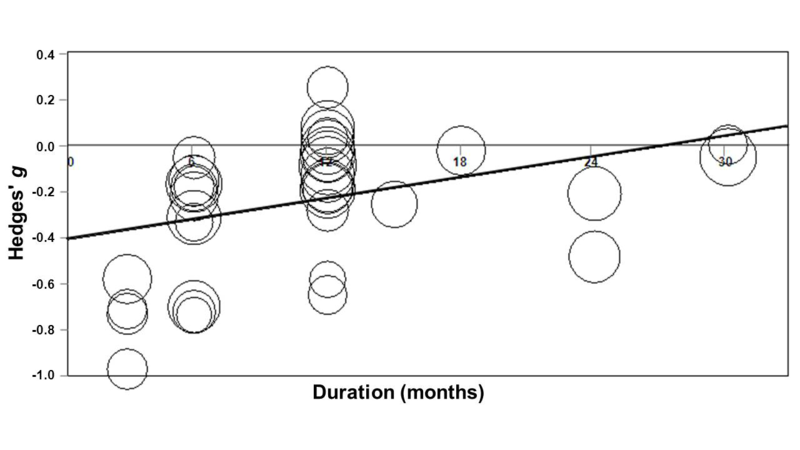 Because of the fairly consistent finding that treatment effects were higher in short-term studies than in long-term studies, we performed a mixed effects meta-regression to explore the association between study duration and effect size. The effect size seemed to become smaller in studies with longer follow-up, although the association was not significant (Hedges’ g=–0.321+0.006*months; P=.07). After removal of one outlier study  that had a very long follow-up (5 years), the effect size significantly decreased over time in studies lasting 3 to 32 months (Hedges’ g=–0.415+ 0.015*months; P=.008; Figure. 11). We performed sensitivity analyses for each of the six domains of bias assessed with the adapted Cochrane Risk of Bias Tool by comparing the standardized primary outcomes of the studies with the low risk and unknown/high risk of bias (Multimedia Appendix 7). There were no significant differences in pooled effect sizes in any of the domains except for the domain random sequence generation, in which the pooled effect was significantly larger in the subgroup of studies with unknown/high risk of bias. 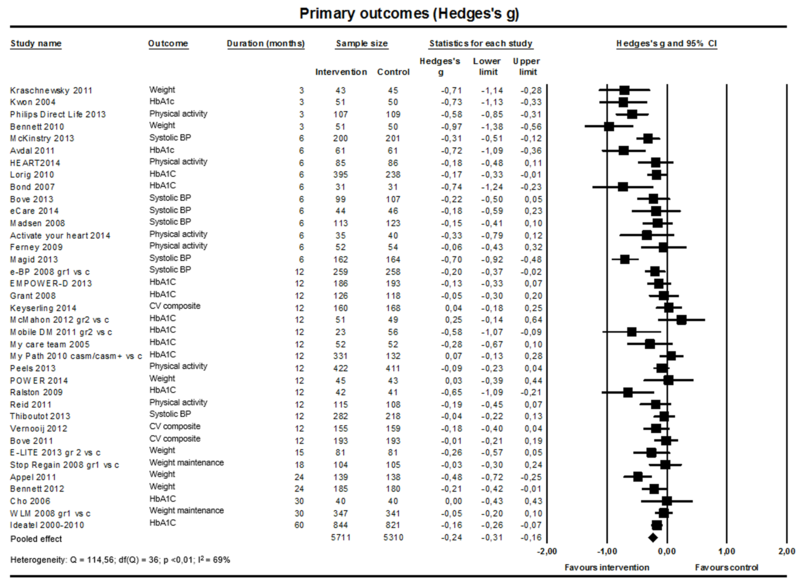 In this systematic review and meta-analysis, we found for people with elevated cardiovascular risk, Web-based interventions lead to improvement of systolic and diastolic BP, HbA1c, weight, LDL cholesterol, physical activity levels, and cardiovascular risk composite scores. Only seven studies included participants all aged 50 years or older. Therefore, our conclusions apply for the population in middle age and beyond. Effects were more pronounced over the short term (study duration <12 months) and in studies that tested a blended intervention (combination of an Internet application and human support). We found no evidence for an effect on incident cardiovascular disease. Our findings on single cardiovascular risk factors are consistent with conclusions of other meta-analyses in younger adult populations [19-21]. We found a significant reduction in systolic BP of 2.66 mmHg. A reduction of 3 mmHg in systolic BP can lead to an 8% reduction in annual stroke mortality rate and a 5% reduction in annual coronary heart disease mortality rate . We found a reduction of LDL cholesterol of 2.18 mg/dL (converted=0.06 mmol/L). A reduction of 0.5 mmol/L in LDL cholesterol for at least 2 years can lead to a reduction in coronary heart disease events of 20% . Theoretically, assuming a linear relation, a reduction of 0.06 mmol/L could lead to a 2.4% reduction of coronary heart disease events. Thus, the effects on Internet interventions on BP reduction and, to a lesser extent, LDL cholesterol reduction, can be clinically relevant at the population level if reductions are maintained. In addition, we evaluated the effect on the complete cardiovascular risk profile and prevention of cardiovascular disease, which has not been performed before. One other systematic review without meta-analysis that evaluated Internet interventions for lifestyle change in older people reported that interventions with multiple components are more effective than interventions with a single component . We found that the beneficial effects of Web-based interventions decline over time and effects are larger when interventions are combined with human support. Decreasing adherence over time was reported in several studies included in our meta-analysis and could be an important contributor to the decreasing effect over time. We were unable to formally test this because information on adherence and engagement was only reported by 22 studies and definitions varied widely. The identified effect moderators are not specific to Web-based interventions for cardiovascular risk factors [85,86]. Maintenance of behavioral change is notoriously complex and best achieved in longer studies with intensive interventions, more face-to-face, and more follow-up contacts. However, such interventions lead to high attrition rates, probably reflecting selection of the most motivated participants . A careful balance should be sought between effectiveness and implementability when designing cardiovascular risk management interventions, whether or not an Internet-based approach is used. Our results do not show a beneficial effect of Web-based interventions on incident cardiovascular disease. Although the declining effect over time could play a role, more likely explanations for these findings are the limited follow-up time of the studies to detect these outcomes (mean length of the studies was 13 months) and the fact that these outcomes were not the primary focus of these studies. Because of the latter, data collection may not have been systematic and adjudication of the data by an independent committee may be lacking. Therefore, we cannot draw strong conclusions from these findings. The results of this study should be interpreted with caution because of several limitations. The methodological quality of the studies was fair, but none of the studies was double blind, rendering them prone to performance bias. Only 20 studies had a blinded outcome assessment, so detection bias may also be present. Because the sensitivity analyses for the risk-of-bias assessment did not reveal significant differences between the low risk and unknown/high risk-of-bias subgroups, except for the domain of random sequence generation, we think that our findings have not been largely affected by these potential sources of bias. Another limitation is the substantial heterogeneity in several of the meta-analyses that is, in part, explained by two effect modifiers: study duration and intervention type. Patient groups with a higher burden have a larger window of opportunity for improvement potentially resulting in larger intervention effects , which could also have contributed to heterogeneity. We could not draw firm conclusions on the difference between primary and secondary prevention, because only four studies on secondary prevention were included in this analysis. Last, there is a potential for publication bias and small study bias. Most of the studies with small sample sizes reported large effects and similar studies with null findings did not appear in the funnel plots (Multimedia Appendix 5). Strengths of our study are the comprehensive search strategy, the quantitative meta-analysis, and the assessment of the effect of Web-based interventions for all cardiovascular risk factors using both intermediate and clinical outcomes. Our search strategy was comprehensive because we used a broad definition of Web-based interventions and only excluded telemedicine and mobile phone interventions. It was not always possible to set Web-based interventions apart from telemedicine and mobile phone interventions. As long as the Web-based program was the main component of the intervention, we judged the study eligible for our systematic review. By pooling the effect sizes on all different cardiovascular risk factors, we aimed to assess the overall effect of an Internet-based approach for people with increased risk of cardiovascular disease. This approach provides insight into the overall potential of Internet-based interventions in this field. Although basic computer literacy as an inclusion criterion probably led to selection of participants with a relatively high socioeconomic status, several studies included in the meta-analysis focused on people from medically underserved areas. Therefore, the external validity of the results might be acceptable and may be generalizable to middle-aged to older primary care populations with an increased risk of cardiovascular disease. Our results show that Web-based interventions can be effective in improving the cardiovascular risk factor profile of middle-aged and older people, but effects are modest and can only have clinical relevance on the population level if sustained over time. Considering the current interest and focus on eHealth by policy makers, funding agencies, and a myriad of research and patient organizations [89,90], it is important to evaluate the actual evidence base objectively. Unrealistic expectations of the effectiveness of Web-based interventions obscure the true challenges that have to be overcome first, including testing interventions that were designed specifically for older people, improving methodological robustness of studies, and improving sustainability of effects. On the macro level, trials can assess sustainability by prolonging follow-up, recording clinical events, and measuring surrogate cardiovascular outcomes (eg, BP, cholesterol levels, and weight) at multiple time points (eg, at 6, 12, 24, and 36 months). On the micro level, adherence should be evaluated by studying intervention usage through time with standardized evaluation methods. Sustainability is of particular importance because long-term effects are required for primary and secondary prevention to truly contribute to the prevention of cardiovascular disease. Web-based interventions combined with human support are more promising than Internet-only interventions. We thank R Spijker, medical librarian at the Academic Medical Centre of Amsterdam, for his assistance in designing and conducting the search and M Siervo, lecturer in Nutrition and Ageing at the Institute for Ageing and Health, Newcastle University, for his advice on our statistical analysis plan. We also thank the study authors (LA Volk, CC Quinn, and JD Ralston) who provided additional data. The research leading to these results has received funding from the European Union Seventh Framework Programme (FP7/2007-2013) under grant agreement no. 305654. The funders had no role in study design, data collection and analysis, decision to publish, or preparation of the manuscript. CRB had full access to all data in the study and takes responsibility for the integrity of the data and the accuracy of the data analysis. ER, EMvC, WvG, CB, MK, SA, and HS conceived the study. CRB, BS, and ER wrote the study protocol and analysis plan. CRB and BS collected and extracted the data, with support from ER and EMvC. CRB performed the statistical analysis, supported by BS, ER, WB, and WvG. CRB and ER drafted the manuscript and all authors critically revised the manuscript for important intellectual content. Summary of the risk of bias assessment. Risk of bias assessment: sensitivity analyses for the domains of risk of bias. ©Cathrien RL Beishuizen, Blossom CM Stephan, Willem A van Gool, Carol Brayne, Ron JG Peters, Sandrine Andrieu, Miia Kivipelto, Hilkka Soininen, Wim B Busschers, Eric P Moll van Charante, Edo Richard. Originally published in the Journal of Medical Internet Research (http://www.jmir.org), 11.03.2016.